Local recurrences after conservative surgery and WBRT are most likely to occur in the immediate vicinity of the lumpectomy site. This fact has prompted the investigation of new approach of limited-field RT. Brachytherapy using either low or high dose rates delivering the total dose during a few days after surgery is advocated by several teams. While with interstitial brachytherapy the first results at 5 years are promising, the results with the MammoSite balloon device are still immature with a relatively short follow-up. The balloon catheter applicator has been developed in North America because of the theoretical disadvantages reported after the standard catheter-based interstitial brachytherapy. In the U.S. very few clinicians are familiar with the technique: many patients and health care find the placement, appearance, and the numerous puncture sites disturbing. 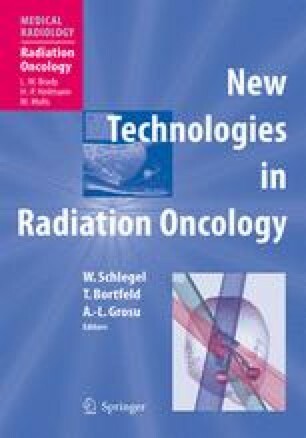 If a simpler, safer, and quicker technique for the delivery of radiation could be offered to patients with early-stage breast cancer, such an approach could theoretically increase the breast-conserving therapy option to more women and improve their quality of life. Accelerated PBI is logistically simpler and a more practical method for breast-conserving therapy, but it has to be demonstrated in randomized phase-III trials that it is at least equivalent to WBRT before its routine use.